Good Saturday morning! Situational awareness ... Why tomorrow's national election in Italy matters, per the N.Y. Times' Jason Horowitz in Rome: "The political forces that have torn at the global order and the European Union have settled into the mainstream. Fascists rallied in large numbers in Italian piazzas. ... Formerly unthinkable suggestions, like the mass deportation of migrants, became virtually routine." There's a contagion of Washington coverage that isn't worthy of your time. The stories sound dramatic but tell you little, if anything. Why it doesn't matter: All we know is what yappy witnesses tell reporters they were asked about. News flash: Mueller is looking at everything. That's his job. When he was named, he was empowered/instructed to look into the "FBI investigation of Russian government efforts to influence the 2016 presidential election and related matters." That there is a broad mandate. This gives us literally zero insight into what the special counsel is actually doing and thinking. These kernels aren't from Mueller's office: We've seen time and again (and again) that his office is one of Washington's few leak-free zones. Yes, it looks bad. Based on conversations with White House insiders, I can tell you they're more bearish than ever about the outcome. But we're all guessing. Be smart ... Jonathan Swan emails me: "The very important collective impact of this reporting is that it could make Trump more angry than ever about the probe." The bottom line ... Here's one headline that's true: "Expect more ‘surprises’ from Mueller probe, former crusading prosecutor says." And expect plenty more "scoops" about what Mueller is asking gabby witnesses. 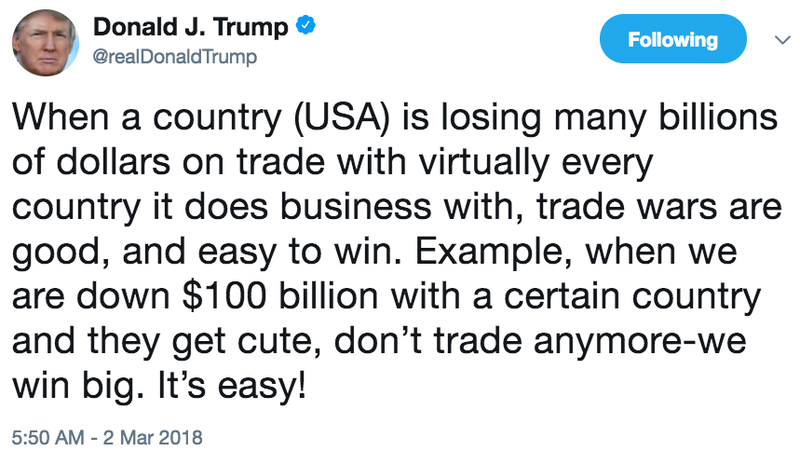 Red cape for K Street: "Several people familiar with the process suggested that, despite the declarative statements from Mr. Trump and the official conducting the briefing, the contours of the package, including the possibility of exempting certain countries, could still change." Why it matters: "Governments around the world blasted Mr. Trump’s plans, and issued threats of retaliation." Houston Chronicle front page: "Steel tariffs would puncture Big Oil." L.A. Times: "Trade war could spark food fight, California growers fear." Conservative radio host Hugh Hewitt, who voted for Trump: "#Disaster." Wall Street Journal's Greg Ip: "Trump’s Pro-Business Agenda Takes a Hit." Wall Street Journal editorial: "Protectionism may be his only real policy conviction, and his tweet confirms he doesn’t know what he’s talking about." WashPost A1: "This Ohio steel town needs more than tariffs can give: Trump won Ashtabula with tough trade talk, but residents see the reality." N.Y. Times' Upshot's Neal Irwin: "a signal about the willingness of the president to ignore his most sober-minded advisers and put the global economy at risk to achieve his goal of better terms for American trade." More Neil: "[B]y invoking national security concerns as the rationale for the action, the president was setting a precedent that could give other countries more wiggle room to use security as a reason for imposing tariffs on American goods." Why it matters: "Russia’s thousands of missiles easily could overwhelm existing U.S. missile defenses in the event of a full-scale war. Washington relies on the threat of its own vast nuclear arsenal to deter an attack from a global power." Be smart: "U.S. officials recognize that the advanced missile technologies Russia and China are developing will probably end up in the arsenals of other countries." 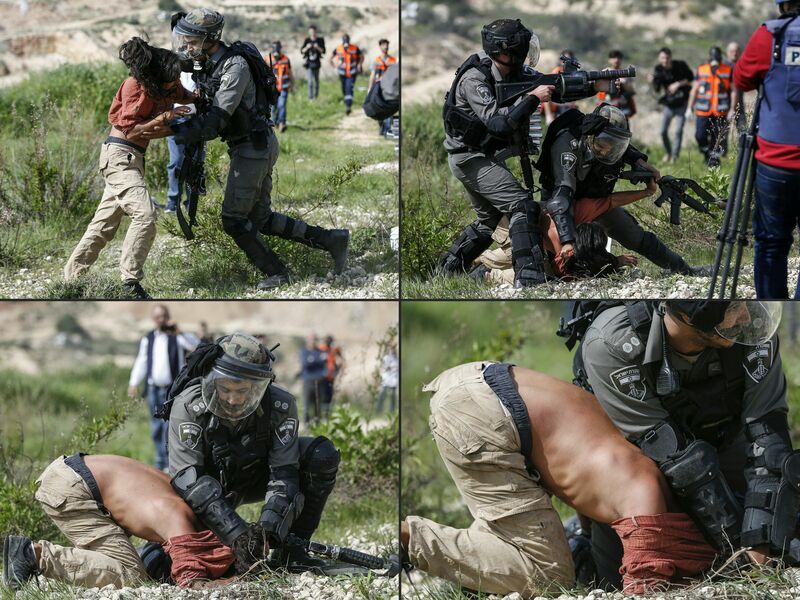 These two combinations of pictures show Israeli border police arresting a foreign demonstrator during a protest yesterday in the West Bank village of Bilin, near Ramallah. 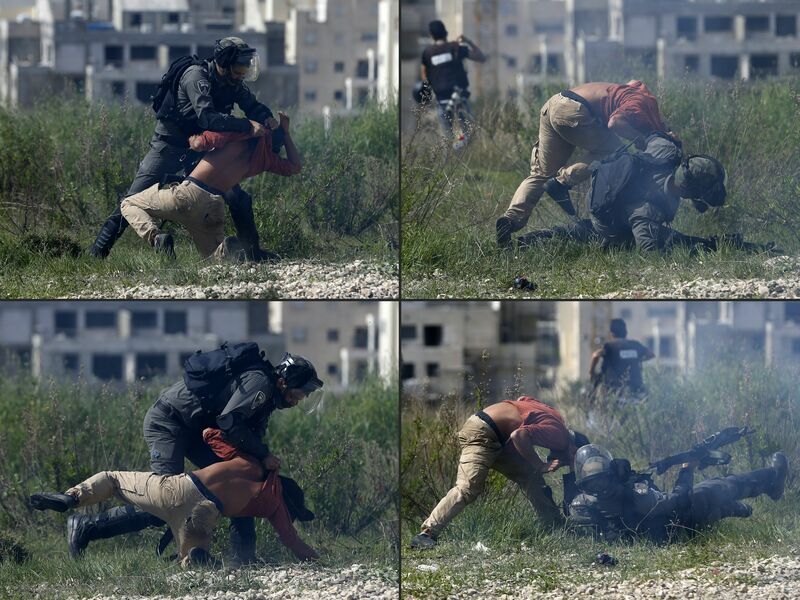 The combination of pictures below shows Israeli border police dragging a foreign demonstrator, whom they arrested yesterday during a protest, through a gate in the controversial separation wall between the West Bank village of Bilin and the Israeli settlement of Modiin Ilit. 4. Video: Facebook holds Safety Summit in D.C.
Facebook officials came to Washington to talk about solutions to problems with how the platform is used ("Connect in Meaningful Ways Online ... Building Better Products for Families ... Young People, Technology and Well Being"). Go deeper ... Wall Street Journal front page, "Tone-Deaf: Facebook's Russia Bungle." "[I]n the Bay Area ... egg-laying chickens are now a trendy, eco-conscious humblebrag." "[C]hicken owners approach their birds as any savvy venture capitalist might: By throwing lots of money at a promising flock (spending as much as $20,000 for high-tech coops). By charting their productivity (number and color of eggs). And by finding new ways to optimize their birds’ happiness — as well as their own." "While the rest of the nation spends $15 on an ordinary chicken at their local feed store, Silicon Valley residents might spend more than $350 for one heritage breed, a designation for rare, nonindustrial birds with genetic lines that can be traced back generations." "They are selecting for desirable personality traits (such as being affectionate and calm — the lap chickens that are gentle enough for a child to cuddle), rarity, beauty and the ability to produce highly coveted, colored eggs." "All of it happens in cutting-edge coops, with exorbitant veterinarian bills and a steady diet of organic salmon, watermelon and steak." "Scaramucci is among a group of former staffers who left 'under adverse circumstances' [and were] placed on an 'administrative exclusion list,' the White House said ... Those former employees must have any appointments on the premises 'evaluated on a case by case basis.'" An email provided by Mooch shows that an aide who asked about access for Scaramucci was told that "only White House Chief of Staff John Kelly or Deputy Chief of Staff Joe Hagin could override Scaramucci’s exclusion." An insider texted me: "Never start a war with a 4 Star Marine general." 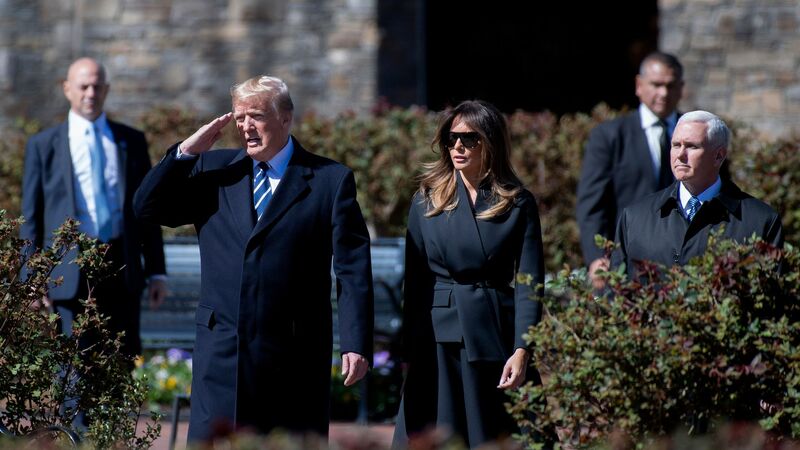 "One person said it’s been two weeks since he saw the president eat a hamburger." "Still, he is allowing himself indulgences. He ate bacon at breakfast one day this week." Why he matters: "[H]e has become the most prominent political prisoner in Latin America, if not the world. His case has been championed by just about every human rights organization on earth." "López was arrested in February 2014 after leading a public protest that turned violent. ... Before his arrest, he was among the most prominent and popular opposition leaders in Venezuela. Polling suggested that he could defeat President Nicolás Maduro, the unpopular successor to Hugo Chávez." "The Venezuelan government routinely disparages him as a right-wing reactionary from the ruling class who wants to reverse the social progress of chavismo and restore the landed aristocracy; the Venezuelan right, meanwhile, considers López a neo-Marxist, whose proposal to distribute the country’s oil wealth among the people would only deepen the chavista agenda." 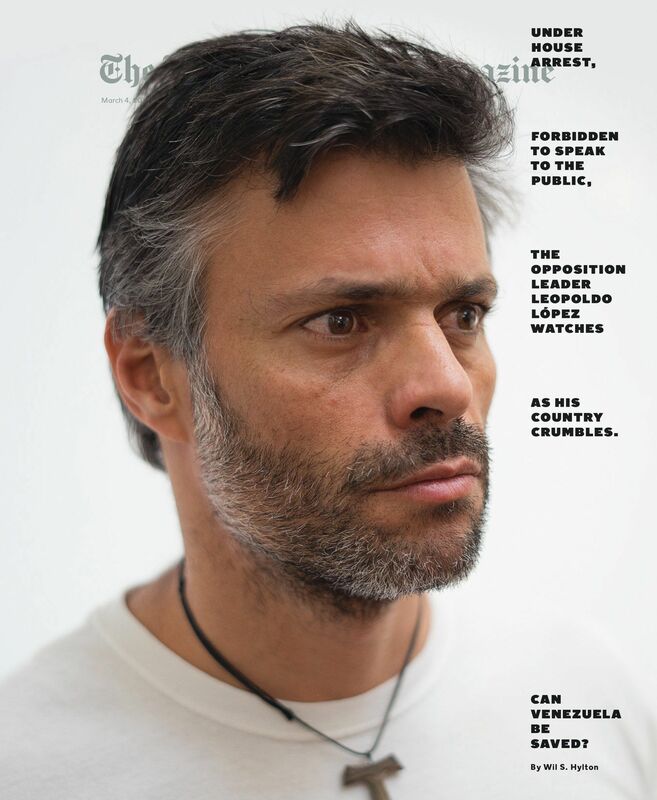 Update: "Since the publication of this article, armed guards from the Venezuelan intelligence service have raided and occupied the residence of Leopoldo López. Members of the Venezuelan National Assembly gathered in front of the house, along with local media and citizens, to protest the invasion and threats by the Venezuelan government that López will be returned to military prison." "The center has gradually introduced rap music into its programming, with rappers like Nas and Kendrick Lamar performing with the National Symphony Orchestra." "Q-Tip from A Tribe Called Quest has been named artistic director for hip-hop culture. Last year, LL Cool J became the first rapper inducted into the elite ranks of Kennedy Center Honors recipients." A full-time staffer, Simone Eccleston, is director of the new hip-hop culture department. As far back as 2008, rapper Mos Def performed at the Kennedy Center, sneaking in as part of the jazz programing. "Inside the building, staffers refer to the traditional programming staples by the acronym SOB: symphony, opera and ballet. President Deborah Rutter acknowledged that the shift has sparked some concern among what she called 'the dyed-in-the-wool, I only want to hear "La Traviata"' audience." Pianist Jason Moran, the center's artistic director for jazz, laughingly recalls a moment before Lamar's 2015 performance when a member of Lamar's team asked, 'Who's coming to this thing, man?'"